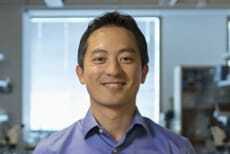 NYSCF – Robertson Neuroscience Investigator Dr. Takaki Komiyama of the University of California, San Diego, published the latest work from his lab on motor learning. The research, published in Nature, describes the scientists' discovery that the motor cortex, a part of the brain long known to control motor actions, actually plays an active role in learning new motor movements. This research could lead to new approaches for the treatment of learning and movement disorders, including Parkinson's disease.